The US secretary of state has held talks in both Azerbaijan and Armenia in a bid to end a long-running dispute over the enclave of Nagorno-Karabakh. Visiting both countries on the same day, Hillary Clinton told them that the US was ready to help achieve peace. The two nations have been in dispute about the territory since a 1994 ceasefire ended a three-year war that claimed up to 30,000 lives. 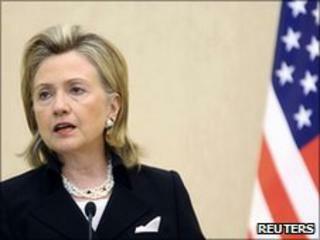 Mrs Clinton also urged Turkey to normalise ties with Armenia. The US secretary of state is on a tour of Eastern European nations and the Caucasus region. On Monday she visits Georgia on the final stop of her trip. On Sunday, Mrs Clinton visited Azerbaijan for talks with President Ilham Aliyev before flying to Armenia to meet President Serzh Sarkisian. Speaking at a news conference, Mr Aliyev stressed that the ongoing dispute about Nagorno-Karabakh was "the major threat" to Azeri security. He raised the issue of ethnic Azeris displaced from the Armenian enclave by its unilateral declaration of independence who have lived since the 1990s in other parts of Azerbaijan. "We want to find a resolution as soon as possible," Mr Aliyev said. In response, Mrs Clinton told him that achieving a peace deal was a "high priority" for the US - a message she reiterated after talks with his Armenia counterpart. "We know this will not be easy but we think it is the necessary foundation for a secure and prosperous future," she told reporters in the Armenian capital, Yerevan. Ethnic Armenian-Azeri frictions first exploded into furious violence in the late 1980s in the last years of the Soviet Union. Nagorno-Karabakh declared itself independent in 1991 - a declaration still unrecognised elsewhere - heralding three years of bitter fighting. Today, despite progress in 2008 and 2009, the issue remains unresolved. Azerbaijan demands an immediate withdrawal of Armenian forces from the territory. Armenia insists on the enclave's independence. Mrs Clinton also called on Azerbaijan to show more respect for civil liberties, and for progress on the normalisation of ties between Armenia and Turkey. The two sides agreed in October to establish diplomatic links and open their border after decades of hostility linked to the 1915 killings of hundreds of thousands of Armenians under the Ottoman Empire. But ratification of the deal has since faltered. "We urge Turkey to take the steps that it promised to take and that both sides continue to try to find the opportunities to open doors to reconciliation and normalisation," Mrs Clinton said.